I’ve noticed recently, especially with the Sonic Bacon Double Cheddar Croissant Dog, that the two flavors of cheddar cheese sauce and bacon aren’t seen together very often. I wonder why, because they taste amazing together and are definitely underutilized in our culinary society. 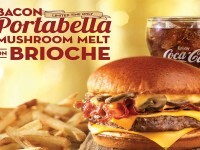 This was the type of thinking I had while trying the new Baconator Fries from Wendy’s. 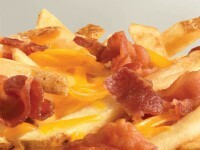 The fries are the typical natural-cut fries that Wendy’s normally produces, but here they are topped with a warm cheddar cheese sauce, shredded cheddar cheese, and large pieces of Applewood-smoked bacon. At first glance, I noticed this had a good portion of fries. 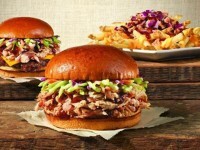 It is hard to compare to a typical fries offering, but there is enough here to be more than just a typical side item. 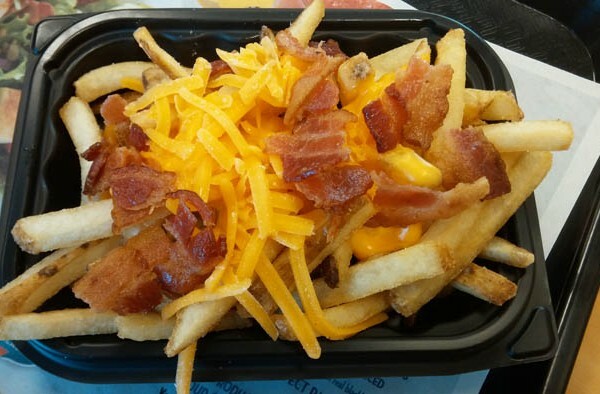 The Baconator Fries are definitely meant for sharing, or as a single entrée item. I really like the texture and flavor of Wendy’s fries. They are crunchier than McDonald’s fries, and have a little more salt than a typical fast food place. Some people might be turned off by the saltiness. The shredded cheese melted into the already melted cheese sauce that oozed over the top of the fries. The bacon pieces were large. I really love Wendy’s Applewood smoked bacon, and here it was no different. It has a nice smoky flavor with a great crisp. The pieces were maybe larger than they could be, and there could have been more of them. The overall combination of the bacon, cheddar cheeses, and fries was amazing. The saltiness of the fries brought out more of the flavor in the cheese, and the bacon/cheese combination is definitely something I’d like to see more of. My only complaint is the amount of cheese, and its unequal distribution on the fries. As you can see from the picture, most of the cheese stays right on the top and center of the fries. The fries around the sides don’t get covered at all. Instead of mixing the cheese/bacon around for a more even distribution, I opted to eat the naked fries first and enjoy the gooey delicious cheese and bacon coated fries for last. Wendy’s major strength is their delicious Applewood smoked bacon, and the bacon really shines. I also am a big fan of their fries, and the cheese and bacon combination on the fries works very well.